Efforts to improve safety and traffic flow through merge areas on high volume/high speed roadways have included early merge and late merge concepts and several studies of the effectiveness of these concepts, many using Intelligent Transportation Systems for implementation. 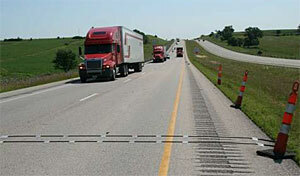 The Iowa Department of Transportation (Iowa DOT) planned to employ a system of dynamic message signs (DMS) to enhance standard temporary traffic control for lane closures and traffic merges at two bridge construction projects in western Iowa (Adair County and Cass County counties) on I-80 during the 2008 construction season. To evaluate the DMS system’s effectiveness for impacting driver merging actions, the Iowa DOT contracted with Iowa State University’s Center for Transportation Research and Education to perform the evaluation and make recommendations for future use of this system based on the results. Data were collected over four weekends, beginning August 1-4 and ending October 16-20, 2008. Two weekends yielded sufficient data for evaluation, one of transition traffic flow and the other with a period of congestion. For both of these periods, a statistical review of collected data did not indicate a significant impact on driver merging actions when the DMS messaging was activated as compared to free flow conditions with no messaging. Collection of relevant project data proved to be problematic for several reasons. In addition to personnel safety issues associated with the placement and retrieval of counting devices on a high speed roadway, unsatisfactory equipment performance and insufficient congestion to activate the DMS messaging hampered efforts. A review of the data that was collected revealed different results taken by the tube counters compared to the older model plate counters. Although variations were not significant from a practical standpoint, a statistical evaluation showed that the data, including volumes, speeds, and classifications from the two sources were not comparable at a 95% level of confidence. Comparison of data from the Iowa DOT’s automated traffic recorders (ATRs) in the area also suggested variations in results from these data collection systems. Additional comparison studies were recommended.